Republican presidential candidate Donald Trump said Wednesday that under his administration there will be no way for those who enter the U.S. illegally to become a citizen. He gave a detailed rundown of his immigration policy plans to supporters in the southwestern state of Arizona hours after meeting with Mexican President Enrique Pena Nieto. 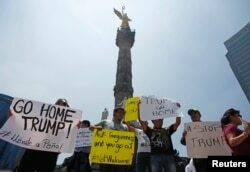 First on Trump's list was the reiteration of his commitment to construct a wall at the U.S.-Mexico border, and that Mexico will pay pick up the cost, despite Pena Nieto's repeated statements that his government will not. "They don't know it yet, but they're going to pay for the wall." Trump asserted the U.S. has the right to pick immigrants who are most likely to "thrive and flourish" and love Americans. "We also have to be honest about the fact that not everyone who seeks to join our country will be able to successfully assimilate." Trump described his immigration policies as prioritizing the security and economic well-being of Americans, and said the proposals would bring down crime, gangs, illegal border crossings and welfare use. "People will know that you can't just smuggle in, hunker down and wait to be legalized," he said. 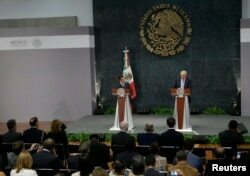 Trump was more subdued at a news conference in Mexico City after his meeting with the Mexican president, which he described as important and straightforward. U.S. Republican presidential nominee Donald Trump and Mexico's President Enrique Pena Nieto give a press conference at the Los Pinos residence in Mexico City, Mexico, Aug. 31, 2016.